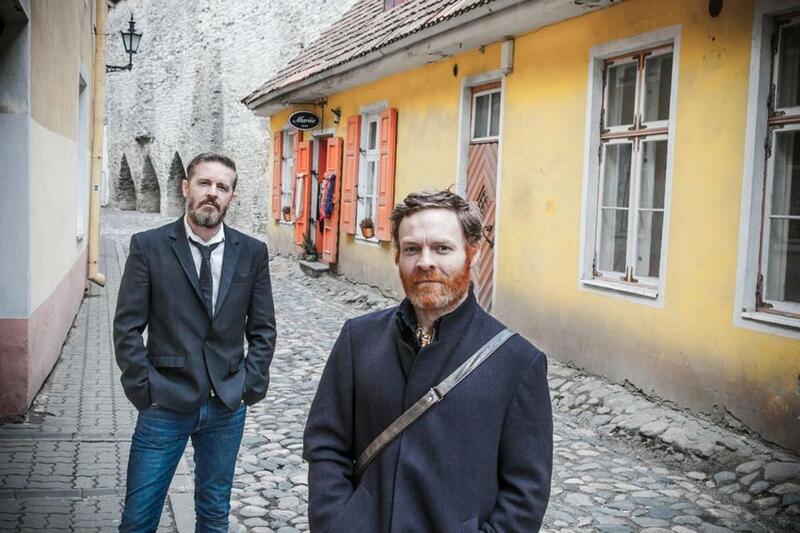 Kevin McCann (front, with co-writer Colin Broderick) seeks backers for his film. Last October, the irrepressible former mayor of Belfast, Máirtín Ó Muilleoir, brought his sixth annual Golden Bridges conference to Boston, an effort to improve business and cultural ties between the northwest of Ireland and the city some Irish refer to as the next parish over. Working the rooms was someone as irrepressible as Ó Muilleoir, a filmmaker and producer named Kevin McCann. McCann was in mission mode, making contacts and looking for backers for a film that is more revolutionary than one might assume. McCann is determined to make a movie about the Easter Rising of 1916, the pivotal moment in Ireland’s independence movement. And he is pursuing it with special urgency, determined to have the film in theaters by next year, the Rising’s centenary. Other films have touched on the Rising, most notably Neil Jordan’s “Michael Collins” (1996) and Ken Loach’s “The Wind That Shakes the Barley” (2006). But both of those films focused on the aftermath of the Rising rather than the Rising itself. The Irish people, in general, and Irish popular culture in particular, tend to pay more attention to the War of Independence and the ensuing civil war, which set the stage for political and cultural divisions that exist to this day. The Rising, its quixotic nature, and the tendency of more recent incarnations of Irish rebels to portray themselves as the natural successors to the revolutionaries of 1916, makes it uncomfortable subject matter in many Irish minds. McCann shakes his head at this. But McCann believes that’s an argument exactly for doing what he wants to do. Jordan built his film around Michael Collins, who ignited civil war with his 1921 decision to accept the British compromise that essentially endorsed the partition of Ireland and included an oath to the Crown. McCann’s main protagonist is Sean MacDiarmada. “Before there was Michael Collins, there was Sean MacDiarmada,” he says. MacDiarmada was the mastermind of the Rising. He was the last of the 16 rebels executed for their roles. Those executions turned out to be a colossal tactical mistake by the British. Before the executions, the rebels had been widely unpopular with the Irish, many of whose loved ones were on the continent, fighting for the British army in World War I. The executions led to a backlash, and inspired others to join the War of Independence that Collins led after his release from prison for his role in the Rising. McCann met with the families of the seven signatories to the Proclamation of an Irish Republic, and it was they who persuaded him that MacDiarmada should be the protagonist of the film. Beyond focusing on a patriot who never got his due, McCann wants to dispel the conventional wisdom surrounding the Rising. It took British forces five days to end the siege, and the Rising leaders’ main concern was to end the suffering of ordinary Dubliners who were becoming collateral damage, McCann says. MacDiarmada was born in Leitrim, the small, remote county in the northwest of Ireland, which explains why Leitrim County Council has committed more than $11,000 to the film. A Kickstarter campaign has brought in upward of $50,000, from 35 countries. McCann is using social media to build buzz and gain attention. There are more than 14,000 Facebook fans and 5,000 Twitter followers. McCann has lined up Sinead O’Connor, the singer, to be in the cast, though her role remains to be determined. Shane MacGowan, the former frontman of the Celtic punk band the Pogues, has agreed to write the song that will close the film. But, just as the rebels who staged the Rising spent so much of their time lining up the finances that would pay for their act of rebellion, McCann has been necessarily preoccupied with finding financial backers for the $6 million he says he needs to make the film. He was at the Berlin Film Festival a few weeks ago, looking for investors, and spent most of last year in North America doing the same. As a producer, McCann’s previous films include 2013’s “Volkswagen Joe,” a short about a mechanic in a border town reluctantly dragged into the Northern Ireland conflict; and the 2009 documentary “The Boys of St. Columb’s,” based on Maurice Fitzpatrick’s book about the school that produced the first generation of Catholic students in Northern Ireland after the 1947 act of Parliament that granted free education. The film’s subjects included the writers Seamus Heaney and Seamus Deane and the singer-songwriters Paul Brady and Phil Coulter. His prior experience as a director has been in short films. But he’s undaunted. As Heaney once said about peace coming to Northern Ireland, McCann believes his odyssey to make this film is a time when hope and history will rhyme. Kevin Cullen, a Globe columnist, can be reached at kevin.cullen@globe.com and on Twitter @GlobeCullen.